We were all born into a war zone. I'm not talking between one nation and another, or people groups, dictators or anything like that. There has been a battle raging in the heavens since before the creation of the world. In fact, when Adam and Eve ate that fruit and ushered in the fall, it really was only the fall of humankind. An original fall had happened, when a created angel wanted the place of God, and the punishment for that stupid idea was to be sent from heaven - with a third of the angels. The devil has been waging war against God, and his plans, ever since. "I'd rather be in the middle of a war-zone inside the will of God, than in a place of (relative) safety outside of his will." Oh, to be foolish enough to be outside his will! It doesn't bear thinking about really. There is a spiritual battle raging for Tallinn. That's why we are here. They say, 'Estonians don't do religion.' And looking around (my Facebook feed is often full of examples proving this fact!) you'd have to say this seems the case. It's certainly not an easy place to plant a church! But, I don't really believe that Estonians, or anyone to that fact, simply 'don't do God.' What I do think is true is that Estonians haven't done God, and haven't had a history of seeing the Bible preached for what it really says. Their rejection, at best, is of a god they think they know about. A god their communist leaders of the past said didn't exist. A belief system laughed at in schools (it still is nowadays too!). Put any Estonian before a living, breathing, healing and all loving, all forgiving God, and they too, like millions of others, suddenly will do God. I'm convinced of the fact. That's a large part of why we are here. 'Tim' doesn't have the answers in himself. Nothing about me is going to change this nation. But I do know someone who can. This last week I had another Estonian tell me they don't do religion, and therefore turned down my offer to them to share my personal story. I was at least able to agree that the God they don't believe in is probably a god I wouldn't believe in either. We'll see if one day he gives me the chance to really share who Jesus is. To plant a church here, to even get up to twenty people (the thought seems like a lifetimes effort away!) is going to take something incredible. Because, as I've said, there is a battle raging for Estonia. 1.7% is a low percentage, for sure. Estonia, though the lowest Christian nation in Europe, must have a higher percentage than that - but, here's the thing. North Korea has a population of 24.9 million people - 1.7% therefore represents 423,000 people! That's a third of the total population of Estonia, or more to the point, the entire population of Tallinn! And yet, there are something like only 4,000 Christians here in the capital, maybe a few more. But not tens of thousands. 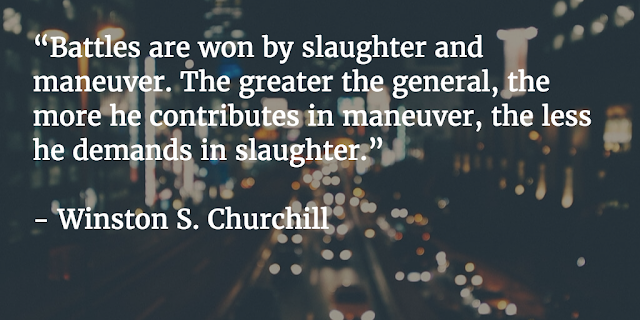 I used the quote from Winston Churchill mainly because we have a General who is Great! The greatest in fact! 2 Chronicles 20:15 says; "For the battle is not yours, but God’s." Thinking about this nation, thinking about the Christian brothers and sisters we are praying will move here to join us, it's wonderfully reassuring to remind myself that this is God's battle. As I said last time in my post on obedience, we are only here because it was first His idea. And that idea involved seeing a vibrant, spirit filled community loving the city and all whom are put before us. Serving this great place, being a blessing to all. Does that stir you? Want to come and join us to see this happen?